Tahini Fuels the Countries that Fuel the World! Maimonides, a Jewish scholar, prescribed tahini almost 1,000 years ago. It’s a calcium food for vegans. When my friend Elia consulted her doctor complaining of debilitating pain in some of her joints, she was surprised to hear him suggest tahini (or tahina) paste rather than prescribing a pill. He explained that this cure came to us through the writings of Maimonides (Rambam), the 12th century Torah scholar, philosopher from Spain. Happy to add a few tablespoons of the sesame seed paste to her diet, she experienced a significant reduction in pain three weeks later. But joint pain isn’t the only reason to eat tahini. It has been a delicious staple of the Middle Eastern kitchen for centuries. Tahini paste is made from either hulled or unhulled sesame seeds (whole sesame seeds). There are a number of reasons to prefer the hulled variety. Tahini paste made from hulled sesame seeds is traditional in the Middle East. The unhulled variety has a strong, dominant taste, which makes it less suitable in certain recipes. While it’s true that the hull does have more nutrients, such as calcium, it also has very high levels of phytic acid – an anti-nutrient that impedes the absorption of those minerals. My suggestion – for both health reasons and for superior taste – buy tahini paste from hulled seeds, preferably prepared in the traditional mechanical method and not chemically processed. 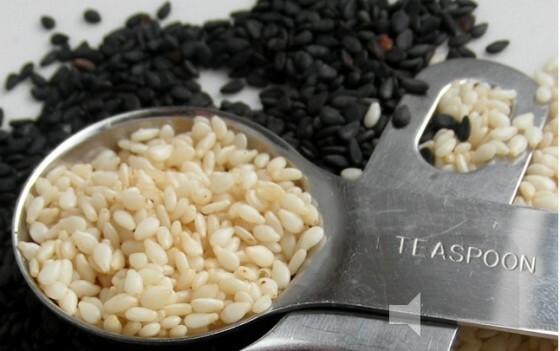 Even when buying the hulled variety, sesame seeds are high in minerals, particularly calcium. This makes it an important food for those not consuming dairy. It’s chock full of amino acids, copper, tryptophan, B vitamins, and other goodies. In addition it also contains sesamin and sesamolin, two antioxidant substances said to be beneficial for the liver and blood pressure levels. Tahini paste is a thick sauce, almost like peanut butter. The oil will rise over time to the top, so it should be stirred well before use. Tahini sauce is simple to make from paste, and much tastier than the prepared varieties you might find in the supermarket. Place all ingredients in a deep bowl and mix with an immersion blender or a whisk. After you taste the results, add a little more of any of the ingredients to make it just to your liking, or extra water to get it to the consistency you prefer. The sauce keeps in the fridge for about a week. It’s great with meat dishes, especially lamb, as a salad dressing, and, of course, as an accompaniment for falafel. I like to add a few spoons of high quality olive oil to the mix. When it’s ready, lay it out on a plate, and add more olive oil and roasted pine nuts. Sprinkle on a bit of sumac, and walla, you are done!